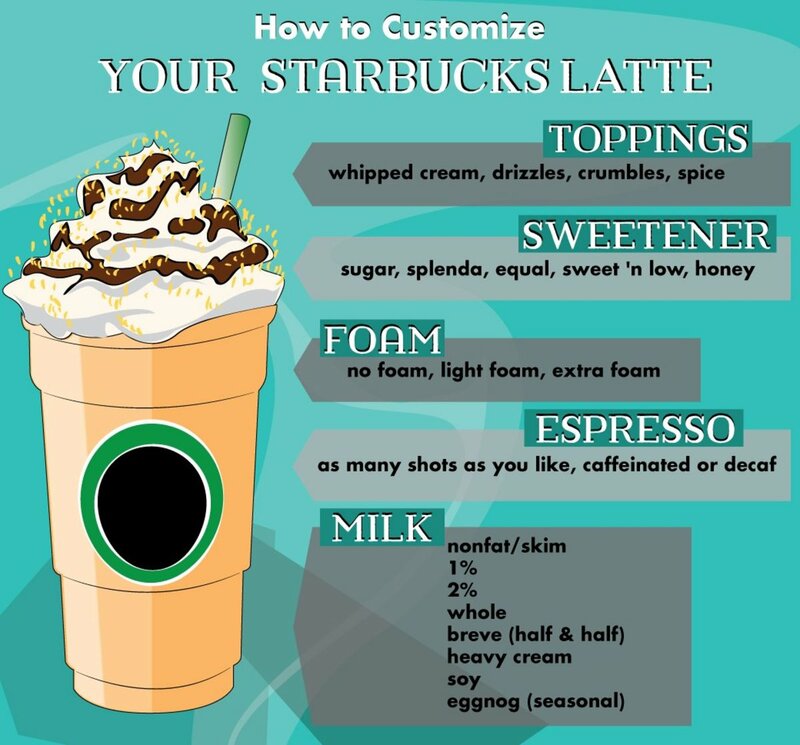 This is yet another installment in my series of Starbucks menu guides. As a certified barista, my favorite part of my job is helping customers gain a better understanding of the menu. Previously, I talked about Blended Coffee Frappuccinos. In this part of the guide, I'd like to address the other half of the Frappuccino section - the blended cremes. Put into the most simple of terms, the Blended Creme Frappuccino is the version of Starbucks' iced blended drink that doesn't contain any coffee. As such, a large number of these beverages are decaf by default. However, there are a few exceptions to the rule. First, let's take a look at the recipe. The Blended Creme Frappuccino has four major components - milk, creme base, ice and flavor. The default milk used is whole milk, but there are plenty of ways to mix it up. There is only one base that can currently be used to make these drinks. The Creme Base that Starbucks uses is sweetened with sugar and as such, there is currently no true light option for a Creme based Frapp. You can certainly save a few calories by choosing skim milk, leaving off the whipped cream and substituting sugar-free syrups where it's an option, but keep in mind that the base itself has a fair amount of sugar in it. You can limit how many pumps of base are going into your drink, but it will definitely alter the taste and consistency of the beverage. 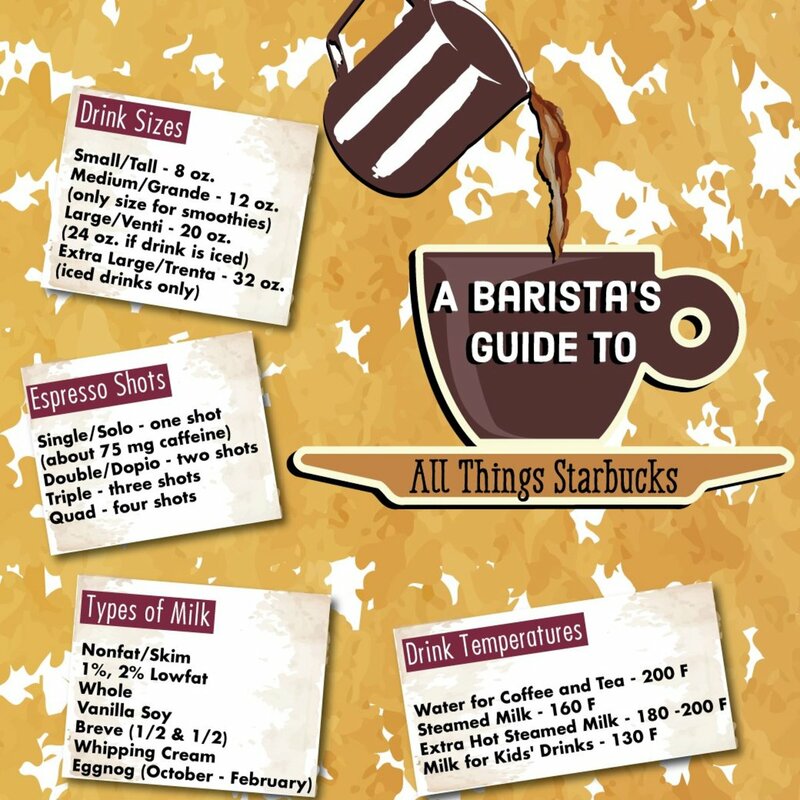 If you want a more in-depth look at how Frappuccinos are made and what types ARE available in a true light version, please check out the previous installment in my guide. The recipes for each Blended Coffee Frappuccino are a little more standard than the Blended Creme Frappuccinos. Here's a quick list of all of the flavors available for these beverages, followed by a closer look at the individual recipes. Any of the flavors and inclusions Starbucks has can be mixed together to create a unique Creme Blended Frappuccino. When ordering, make sure that you specify you want the Creme version. For example, ordering a Cinnamon Dolce Frappuccino will usually result in one made with coffee. However, if you want the creme based one, simply order a Cinnamon Dolce Creme Frappuccino. So we've learned that traditionally, a Creme Frappucino is made with milk, base, ice and a flavoring ingredient. The Strawberries and Creme varies from this standard just a bit. 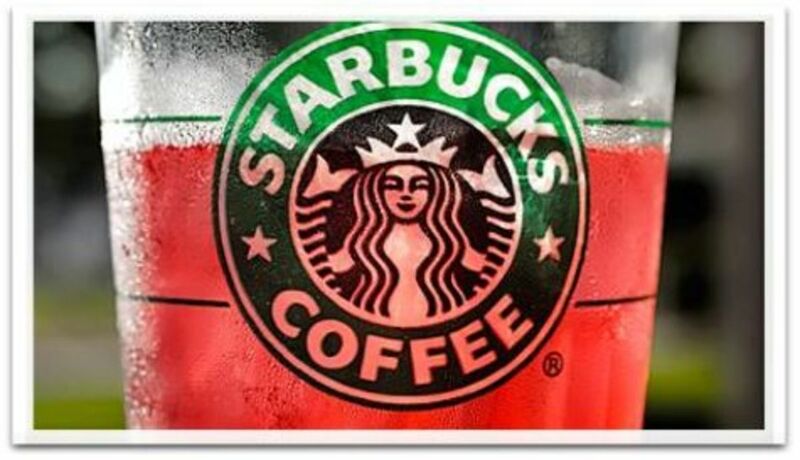 Instead of there being a Strawberry syrup, Starbucks actually uses a strawberry puree to make this beverage. It packs a lot of natural strawberry flavor, and is not sweetened with any additional sugar. 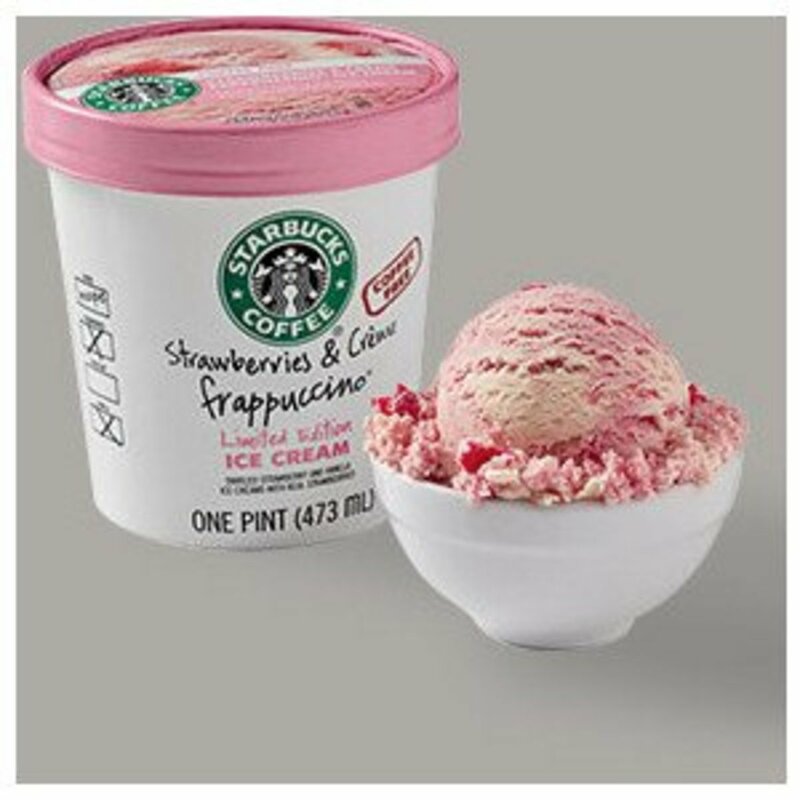 Because of this, there are actually two flavoring components to the Strawberries and Creme Frappuccino. Instead of being composed of just milk, this Frappuccino has equal parts milk and strawberry puree. 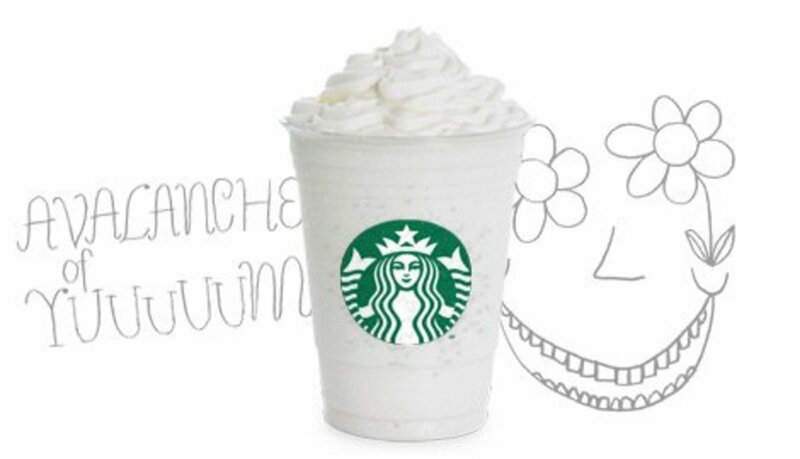 There is more liquid in this beverage than any other Frappuccino, so it can tend to be of a thinner consistency. In addition to the puree, classic syrup is added to sweeten the mix. Again, it varies from the norm - usually, these types of syrups are added to Frappuccinos as 1-2-2 for tall-grande venti. 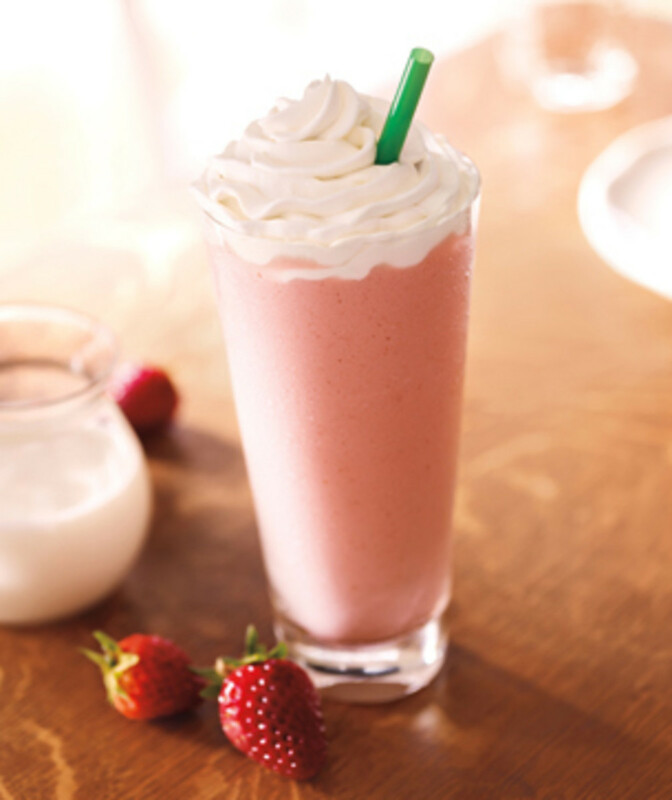 For the Strawberries and Creme, Classic is added as 2-3-4. This is a very sweet Frappuccino and I recommend cutting back on the pumps if you have less of a sweet tooth than the average person. There's a very interesting off-the-menu drink that uses the Strawberries and Creme Frappuccino as a base. 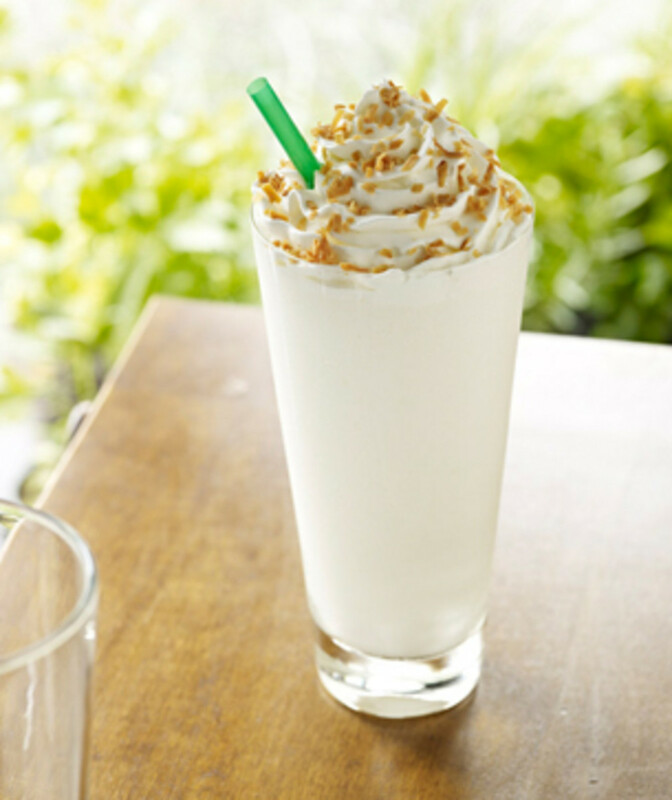 Try adding a little bit of Toffee Nut to this beverage - in my Starbucks, we call it a Crunchberry Frappuccino. 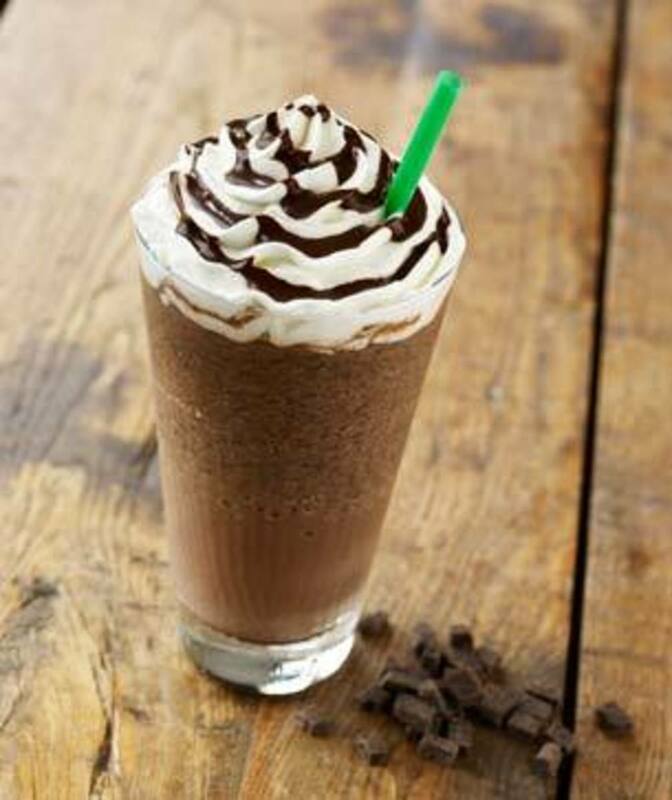 The Double Chocolatey Chip Frappuccino is the creme based version of the Java Chip Frappuccino. 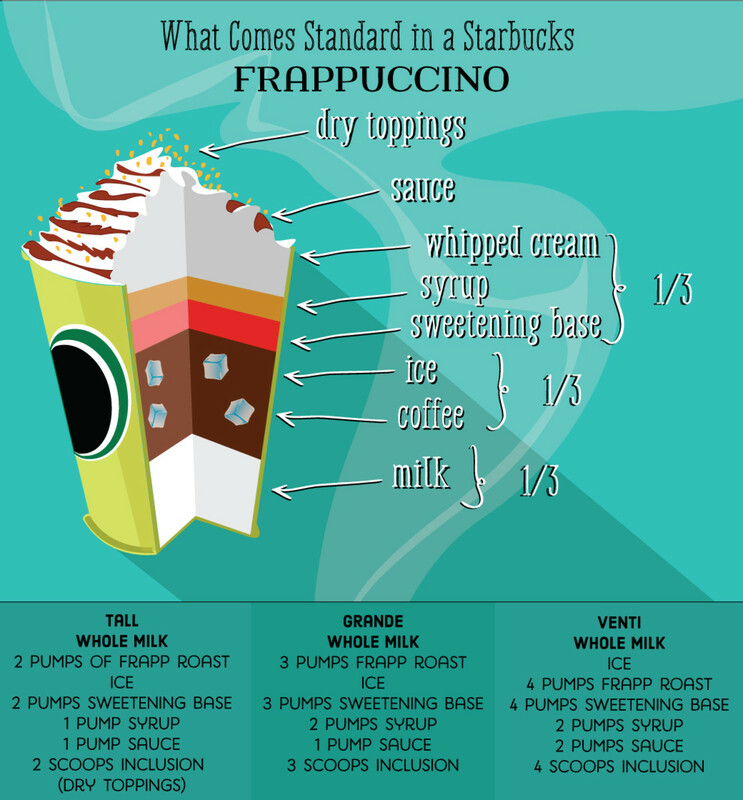 Although everything in this Frapp is added according the the standard, its such a popular beverage that I thought I would provide a little bit of additional information. Not a lot of people are aware of the nature of the ingredients that go into this. 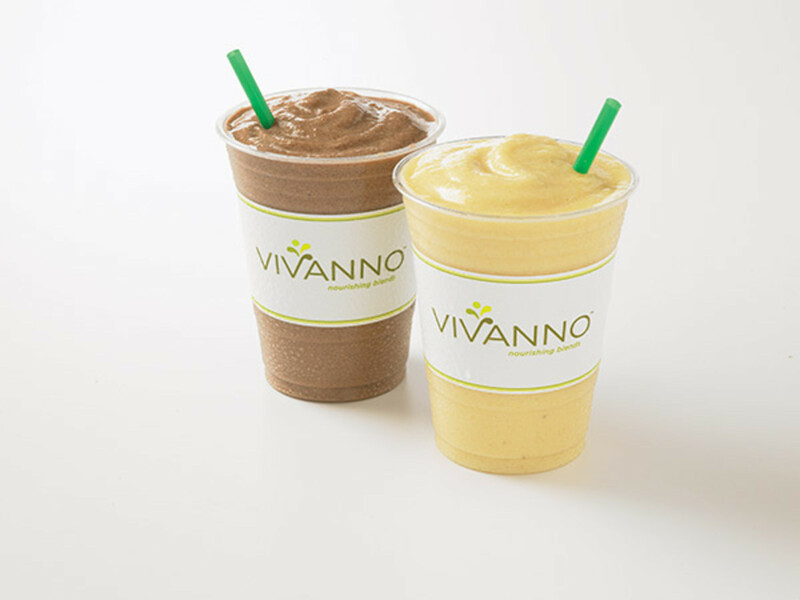 This creme based Frappuccino is just as caffeine free as the Strawberries and Creme or the Vanilla Bean. It is made from mocha syrup and java chips, but both of these ingredients are just fancy ways of saying chocolate. There is not actually any coffee in either the syrup or the chips and this is a point I've sometimes struggled to get across to the customer. I can understand associating the words mocha and java with coffee based beverages, but beyond what is found in any chocolate, I can assure you that there's no additional caffeine added to this drink. The only thing non-standard about the Double Chocolatey Chip is that in addition to the usual whipped cream these Frappuccinos are topped with, this one comes with mocha drizzle as the default. Much like the Double Chocolatey Chip, the Vanilla Bean Creme Frappuccino doesn't actually vary from the normal Blended Creme recipe. I've decided to make a special mention of it because its one of the only Frappuccinos that's made with just a powder instead of a syrup or some combination with a syrup. The usual whole milk, base and ice are added, but Vanilla Bean powder is the sole flavoring agent. For a fun twist, try this drink with caramel syrup and/or caramel drizzle. The addition of both makes it taste like a vanilla milkshake. 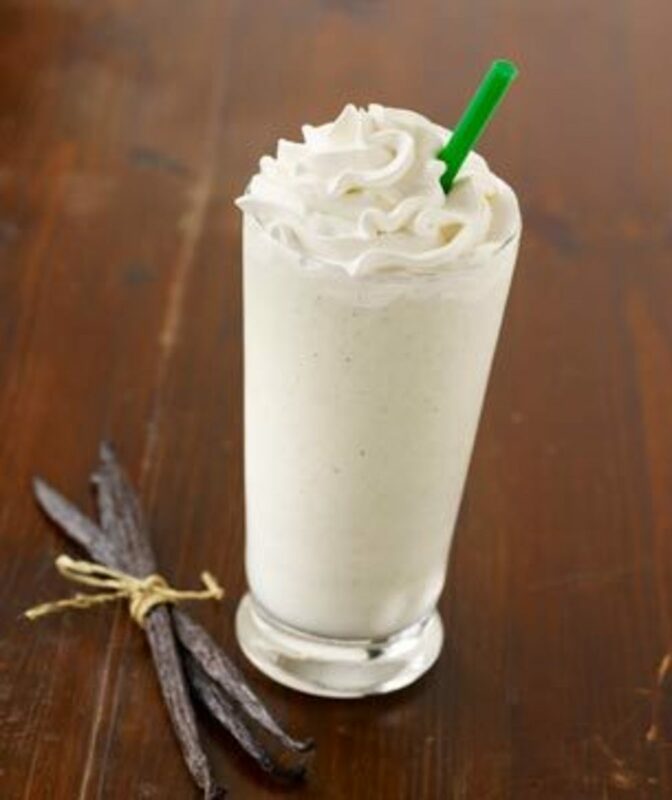 Almost anything can be successfully added to the Vanilla Bean Frappuccino - another favorite is adding java chips. I mentioned that there are some Blended Creme Frappuccinos that contain caffeine, and the Tazo Chai Creme is the best example of that. Currently, Starbucks does not offer any caffeine free alternative to any of their Chai beverages. Both the Chai concentrate and full-leaf Chai tea bags contain a decent amount of caffeine. The Tazo Chai Creme Frappuccino is made with the Tazo Chai concentrate. The amount of pumps in this recipe deviates from the standard. Instead of the 1-2-2 for regular syrups or the 1-1-2 for sauces, the formula is actually 2-3-4 for tall, grande and venti. Since there is so much Chai in this drink, it tends to be a bit thinner than an average Frappuccino, but its absolutely delicious. Before I ever worked for Starbucks, this was the only drink on the menu I knew and its still an old favorite. There are a lot of fun variations for the Chai Frappuccino. My favorite is to add a shot affogato (poured over the top.) Chai is a pretty unique tea in that it pairs well with coffee. Other great flavors to try with Chai are caramel, vanilla, cinnamon dolce or, for the very adventurous, raspberry. 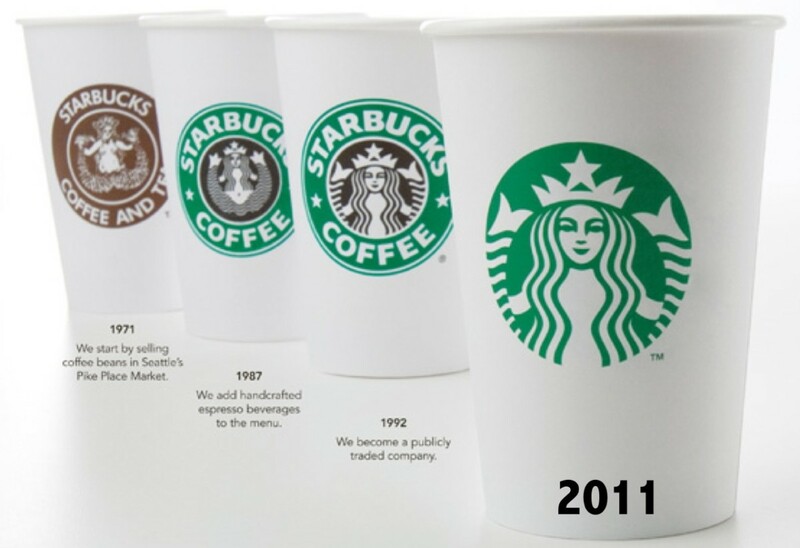 As of 2014, Starbucks has changed tea brands from Tazo to Teavana. However, this Frappuccino is still usually made with the Tazo Chai Tea Concentrate. It can easily be substituted with the new Teavana Oprah Chai Concentrate! The last Creme Frappuccino recipe that I want to touch on is the Tazo Green Tea Creme Frappuccino. This beverage is unique in every sense of the word. With matcha as the main flavoring ingredient, it isn't a drink for everyone. I've talked about matcha in previous guides, but I'll say this about it now - it has a very distinct, earthy taste to it. Matcha is made from ground up green tea leaves and it is caffeinated. The Green Tea Creme Frappuccino is most closely related to the Strawberries and Creme. Although there is no additional liquid added, it does have two flavoring components - not just matcha, but classic syrup as well. As with the Strawberries and Creme, the amount of Classic added is different than you might suspect. Instead of the standard 1-2-2, there are 2-3-4 pumps for tall-grande-venti. One of my favorite Frappuccinos is the Green Tea Creme minus the classic syrup and with peppermint in its place (using 1-2-2 pumps.) It sounds totally out there, but it actually taste a lot like a McDonald's Shamrock Shake. Thanks for reading! I hope you found this guide helpful. If you'd like to learn more about what the Starbucks menu has to offer, check out my next guide, which covers Smoothies. So.. is this drink combo hypothetically possible(2019) and how would you order it? Is it too much? 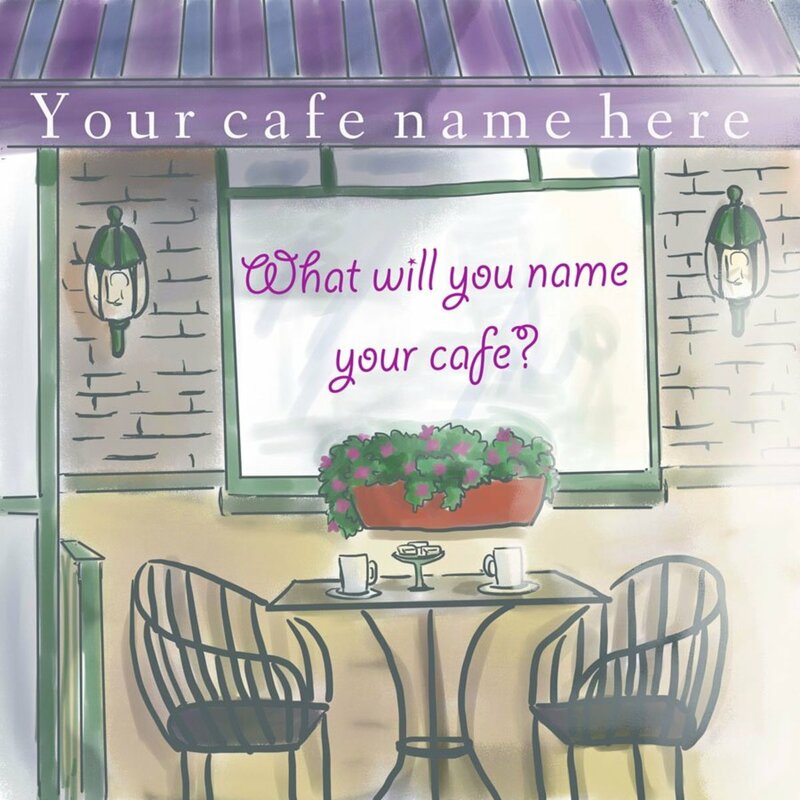 You don't know how many times I've sat parked somewhere NEAR the Starbucks drive thru scouring the web for secret menu items, off menu favorites, creative drink creations offers have tried and what adds or subs I should try. Often times wishing I could just have infinite magical barista knowledge so I could know all the possibilities and create my own perfect drink spur of the moment, season, mood.. because as comforting it is having a familiar go-to Starbucks drink, I can't help but feel jipped or something if I dont know literally all of my options before making the selection I feel most represents me in that moment. (I may be on an unnecessary tangent that no one cares about but) I had to THANK YOU for the detailed info here! Even if you never see this, I'm sending gratitude out to the universe. I wish there was a drink ordering calculator or recipe builder. There's a blueprint in my mind of a chart of sorts... but I think it would have to be four-dimensional to encompass EVERYTHING. How much waffle cone syrup would you use to make a venti frapp. And could you post the milk and ice measurements as well. 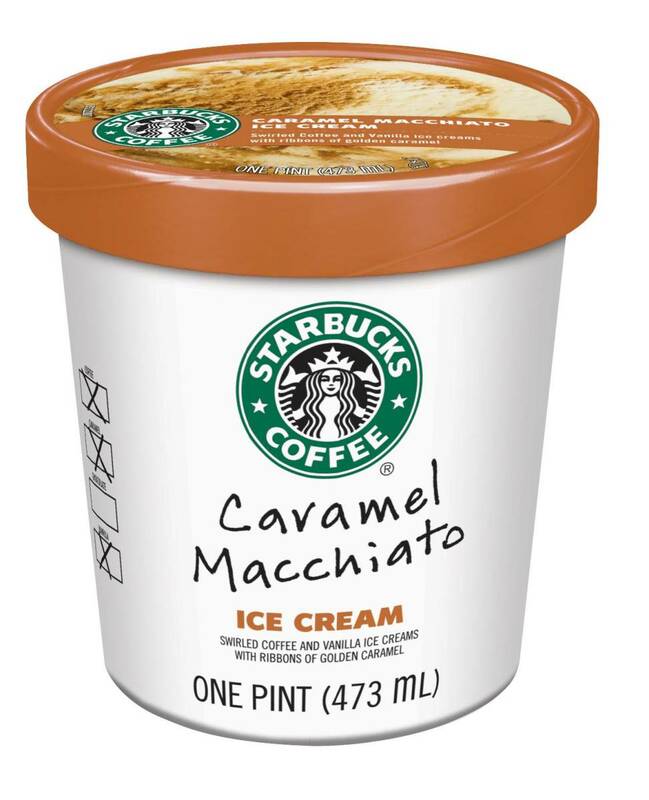 If I had a cream base similar to Starbucks how much of it would I use as well. There are LOADS of coffee-free options @ Starbucks! I too dislike coffee & can sniff out even the tiniest bit in drinks that many would say don't taste of coffee. In addition to various a decent variety of hot & cold teas & tea lattes there are smoothies, creme based frappaccinos, hot cocoas & more. If you like hot apple cider they have a great hot caramel spiced apple that is a delish sweet treat during cold months. Hope that helps! So if I am understanding there are drinks at star bucks that have no coffee or coffee flavor. Which is why I don't go there. I assumed most would have coffee and I can't stand the taste of coffee. So if I understand correctly the difference between the green tea frappe and the vanilla bean frappe is that the green tea frappe also uses pumps of classic syrup where the vanilla bean frappe does not? And obviously one uses green tea powder where the other uses vanilla bean powder. Do you now how big a "scoop" of powder is for the VB or GT? These drinks are both my favorites. I always add peppermint for a holiday like flavor. Adjust your chai recipe. It IS in fact 1-2-2. I'v been stressing this at my store to ensure consistence since I'm a trainer. Check your recipe cards. Hi there you are soo helpful!! I was wondering if you could give me the exact recipe for the double chocolaty chip frap with the ingredients list? Thank you sooooo much! Its my favourite recipe and I cant wait to make it! The additional ingredients you'd need for either the chai or the vanilla bean would be milk, ice and some kind of thickener. I recommend vanilla smoothie powder; the vanilla bean probably won't thicken the mixture as much as the smoothie powder would. Another good substitution is using vanilla ice cream in place of the milk and using less ice in your overall mixture. This makes a REALLY creamy product! There are places where you can buy the thickener Starbucks uses online. I have seen it on both Amazon and eBay. It is called Frappuccino Base, and you would want the Creme Base version. Hi! I found a vanilla bean powder and a Chai syrup. How would you recommend making a non coffee based frap using the vanilla bean or chai syrup? 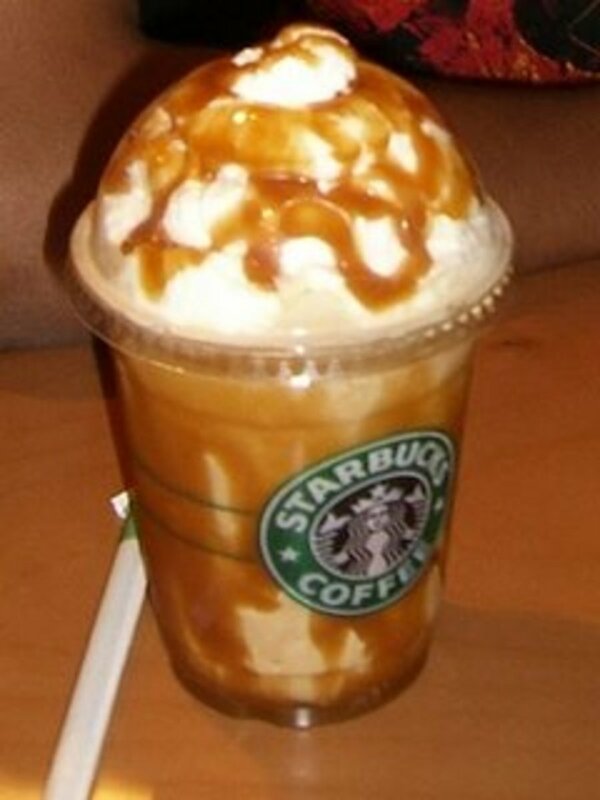 I miss going to Starbucks for a frappoccino. I loved the strawberry and chocolate chip one. I would love to go back there someday. Voted up for useful! I think this would be a good substitute! I haven't tried it myself, but most vanilla powders marketed for the same or similar uses taste good. Has anyone tried the Monin vanilla frappe powder? I was thinking about getting that one to make a copy of a vanilla frappuccino. Do you think it would taste the same? Unfortunately, there is no sugar free creme base. You can substitute the coffee light base, which is not totally sugar free, but has 1/3 of the sugar of the regular coffee base. This does not have caffeine, and it has a very mild coffee flavor, so it's not a bad option for cutting down sugar in a creme frappuccino. For a grande sized Cinnamon Dolce Creme Frappuccino, we would start by measuring milk to the bottom line in the cup. Then, we put the milk in the blender and add a grande sized scoop of ice, which is the same amount of ice that would fill the grande cup (16 oz). Then, we add three pumps of the creme base, which can be substituted with other thickeners at home. Finally, it would get two pumps of cinnamon dolce. I did a guide about home made frappuccinos that might provide you with some better measurements to help you achieve a good consistency. I also detail in it what thickeners I suggest you use. Is there a sugar free creme base? 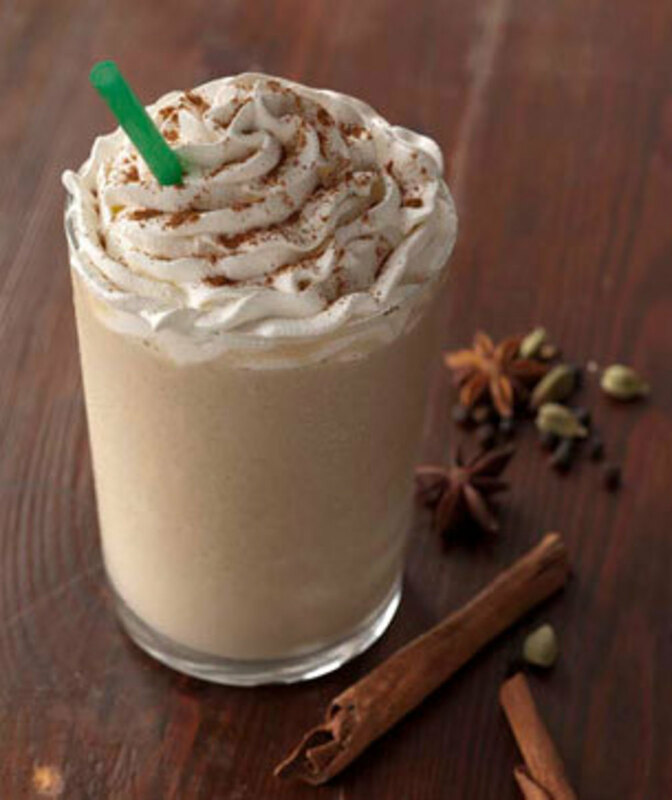 Do you have a recipe for a cinnamon dolce creme frap? I bought the cinnamon dolce syrup from Starbucks, but I can't figure out the correct ratios of milk to syrup to ice to cinnamon. Thanks!! "The amount of pumps in this recipe deviates from the standard. Instead of the 1-2-2 for regular syrups or the 1-1-2 for sauces, the formula is actually 2-3-4 for tall, grande and venti." So I went back this morning and asked a different barista about this (politely of course!) and she showed me their recipe-card booklet and it said 2 pumps for a venti, so I had to eat my words. :) Do you think they've changed the recipe or something? I know I can always ask for a specific number of pumps, but I was surprised that the standard recipe (according to them) came out tasting so un-chai-like -- pretty much just like frozen cream. Bleah. The strawberries and creme is my favorite, thanks for posting! Hi, your info has been so helpful. Would ordering a Mocha and a Chocolate be the same thing? What about White Mocha and White Chocolate- are they the same? I haven't had Starbucks in ages but I definitely enjoy it. This hub makes a run to Starbucks very tempting. I can go for a Coconut Crème Frappuccino maybe. Thanks for sharing your knowledge of Starbucks in this informative and interesting hub. Voted up. For a 12oz drink, you'd add just as much ice; 12oz. We use scoops that are the same size as the cups we serve the frappuccinos in. Wow. This sure is interesting. Blended creme frappuccinos are my favorite! Thanks for sharing! If you mean just a chocolate flavored Creme based Frappuccino, then there would be no Vanilla added by default. It's not necessarily a menu item - we can make any flavor Creme OR Coffee based Frappuccino, but they will be made literally just as you request. 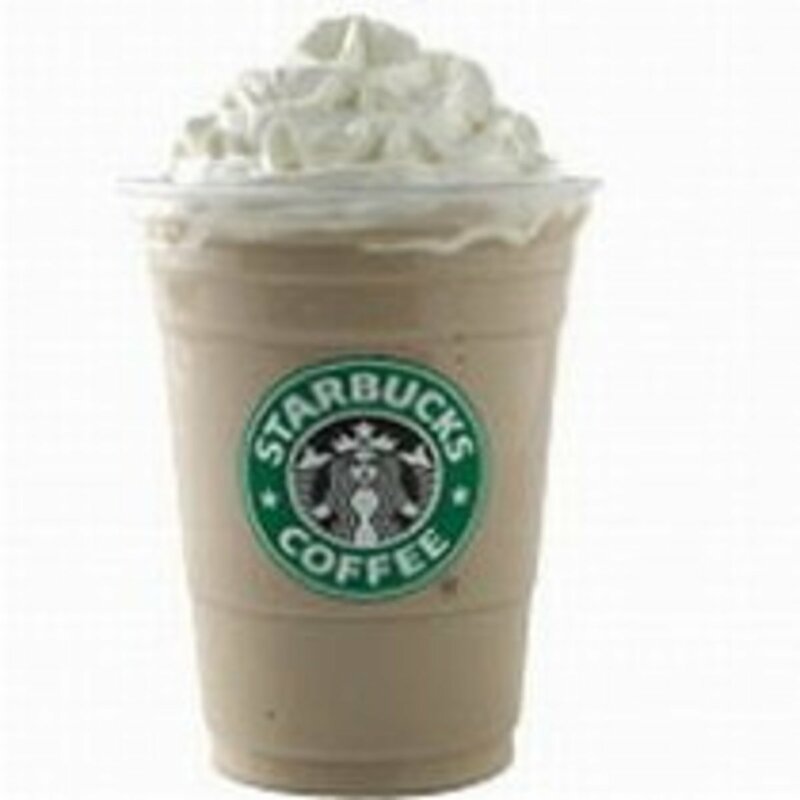 For example, a Mocha (which is the chocolate) Creme Frappuccino would just be milk, Mocha, ice and Creme base. There is a Double Chocolatey Chip Creme Frappucino on the menu, but that is also not made with Vanilla. It is made from milk, Mocha, Java Chips, ice and Creme base. There IS one Creme Frappucino that was a seasonal offering that had Vanilla. It was the Chocolate Cookie Crumble. This was milk, Mocha, Vanilla, Java Chips, ice and Creme base. what's the ingredients for the chocolate creme frapp? I'm unsure if vanilla is used on it? For the Vanilla Bean Frappuccino, the best recipe would be 3/4 cup of milk, 16 oz of ice, and a half of a packet of a vanilla flavored instant pudding mix. For a homemade Vanilla Bean Frappuccino, you'll need milk, ice, and a thickener. Depending on which kind of 'base' you use, you may need to add some vanilla. My best recommendation to you is to use 1/2 packet of a vanilla instant pudding mix. Hi!! I'm a LITTLE obsessed with the vanilla bean creme frapp. I am kinda confused of what I need.. Milk, ice, whipping cream, powder??? Where do I get the powder??? HELP!! How much vanilla powder does go into the vanilla frap, do yo have or have seen the ingredients?? Thank you so much for the corrections and helpful info! I had forgotten completely to edit my hubs. I was away from Starbucks for a short while, and when I returned, I saw that Sugarfree Peppermint had gone. It is possibly a seasonal offering, and we will see soon if it returns! I had never actually looked at the ingredients for the Purees and had no idea they contained white grape juice. Hey, I've been trying to get my hands on the Vanilla Bean Frappuccino recipe for a while now. My question is, do you know how to make the creme base is made? In the Strawberries and Cream, the strawberry that is added is a liquid puree. The Matcha in the Green Tea Frappuccinno is actually a powder, so the drink is made a little differently. There are 2, 3, and 4 scoops of matcha added to a Tall, Grande and Venti Frappuccino respectively. Step by step, the Green Tea Frappuccino is made by adding milk to the bottom line of the cup, dumping that milk into the blender pitcher, then adding pumps of classic (2, 3 and 4) and then scoops of matcha (2, 3 and 4.) Finally the Creme base is added (again, 2, 3 and 4) and a scoop of ice equal to the size of the cup. 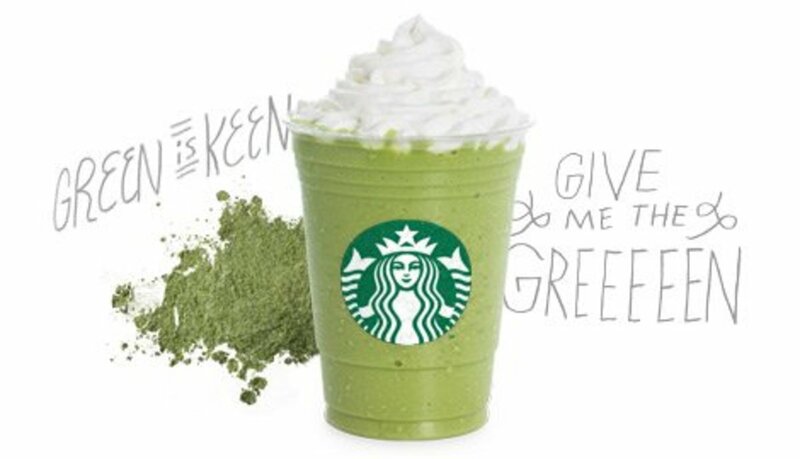 Hi, how much matcha is used with Green Tea Creme Frappuccino? Is it the same as the Strawberries and Creme Frappuccino with equal parts milk and matcha? That looks pretty close, actually! I'll help you break it down. -mocha sauce - The chocolate flavor for the whole thing. This goes in the blender with most of the other ingredients. -vanilla syrup - Adds a little extra flavor and sweetness, making it different from a regular mocha Frappuccino. Mixing Vanilla and Mocha tastes similar to a milk chocolate. -dark chocolate chips - The third of your flavoring ingredients that will get mixed into the blender. I love Frappuccinos with chips because you get these little pockets of extra chocolate. -whole milk - Kind of the main ingredient of any Frapp. You can try any other kind of dairy that you like, but this is the Starbucks standard. -ice - Affects the texture of the drink. -Oreo cookies - These won't go in the blender, but are just for crumbling over top of the whipped cream. -chocolate syrup - You can drizzle some of this over the whipped cream, but I think this is an either/or with the mocha syrup. At Starbucks, the chocolate drizzle we use is just the same thing as the mocha sauce. -1 can of chocolate Reddi Whip. - The best part of the topping! -pectin or xanthan gum - This is instead of the powders I recommended. It'll thicken the drink and make it a better consistency. - and possibly coco powder.... - I can only assume you'd use this as part of the topping, because the mocha and vanilla syrups will do enough to flavor the actual drink. Chocolate Reddi Whip, Mocha Syrup/Chocolate Syrup, Oreo Cookies (crumbled,) and maybe Cocoa Powder. -1 can of chocolate Reddi Whip. Yeah, it's a little tough! I'm not sure what you could get at a regular grocery store that might compare. Here's a couple of links to products like the ones I mean. http://www.amazon.com/MOCAFE-Madagascar-Vanilla-Sm... is the Smoothie mix. I haven't worked out a specific recipe, but I'd think a tablespoon or two of something like this would work. http://www.webstaurantstore.com/vanilla-soft-serve... links to something I've actually used in other coffee shops. Granted, this is a BIG bag and it's hard to find something more realistic for using at home. I've seen that Costco carries a liquid dairy soft serve mix and that might actually work well. Other than those two, I'd suggest actual ice cream, which doesn't taste quite like Starbucks, but still makes a yummy product. I think you might be able to find powder mixes like those at places that sell ice cream makers or smoothie kits for home. Maybe somewhere like Bed Bath and Beyond? I'm not sure, but I'll let you know if I find anything! You are the absolute BEST !!!! I'm gonna go shopping in the morning and give it a whirl. I'll definitely need a better blender that can crush the ice down to the consistency of theirs. The whole..."vanilla powder" thing ...is the part that's confusing me. The Chocolate Cookie Crumble is the creme version of the Mocha Cookie Crumble, meaning it has no coffee added. The ingredients to your favorite Frapp would be Mocha sauce, Vanilla syrup, Frappuccino chips, ice and the Creme Frappuccino base. It's difficult to replicate these recipes at home, but I think I can give you some pointers. First, I'd definitely recommend trying to get your hand on some Starbucks Mocha. A local cafe store might have some version of it for sale, and it's also worthwhile to check the website. I'm not sure if they'd sell the sauce or just the powder, but either version can work. If you can't get Starbucks Mocha, you can try another brand. Torani makes syrups and sauces that are easy to get your hands on, though I'm not quite sure if the ratios would be the same. In a pinch, some melted dark chocolate could work. Mocha itself is just a dark chocolate flavored syrup. Though it's often thought that it contains coffee, the sauce does not, just the drink by the same name does. For the vanilla, I'd again recommend trying to get the Starbucks brand. You won't have to use a ton of it, but it keeps for a while. In stores, we only use a bottle of syrup for a month after it's been opened, but I've used an open bottle for longer at home. Some cafe stores carry sample sizes of the syrup bottles and the website may, as well. Frappuccino chips are actually dark chocolate chips. If you can't get a hold of anything like them, regular chocolate chips aren't a bad substitute. The taste will obviously be a little different, but I've made a version of the Java Chip Frapp using regular chocolate chips and I was happy with the result. Any kind of milk will work, but the Starbucks standard recipe is whole milk. I actually prefer my Frappuccinos with nonfat milk. I've had some customers who order them with heavy whipping cream. It sounds kind of gross, but it makes it like an ice cream treat. The tricky part about making a Frapp at home is finding something to substitute for the Frapp bases, since Starbucks doesn't make them available for purchase. The best alternatives I've found are vanilla powders, specifically the kind you use for smoothies or soft serve ice cream. The only problem with these is that using a powder instead of a thick syrup can change the consistency of your homemade Frapp. I've played around a lot with vanilla powders and while I can't nail the consistency, I've definitely been pleased with the taste - and that's the important part, right? The topping is easy enough. Starbucks makes their whipped creams by hand, but if you're not willing to do that, you can buy chocolate or regular whipped cream in the grocery store. For the cookie crumbles, any kind of chocolate cookie would do, but I'm thinking Oreos. I have searched the ENTIRE web to find a recipe for my fave Starbucks drink---The Chocolate Cookie Crumble (NOT to be confused with the "mocha cookie crumble"). Would you be so amazingly kind as to tell me how to make a Venti Chocolate Cookie Crumble Frapp at home? Puuhhhhlease?? -Thanks! Starbucks' website actually has detailed nutrition guides for pretty much everything on the menu. http://www.starbucks.com/menu/catalog/nutrition?dr... is where you can find the beverages. http://www.starbucks.com/menu/drinks/frappuccino-b... is the Green Tea Frappuccino specifically. However, those links don't go into depth about what makes up the individual ingredients. If you've had any other kind of frappuccino without problems, I'd say it's probably the matcha powder that's giving you a problem. Unfortunately, there's no alternative ingredient. 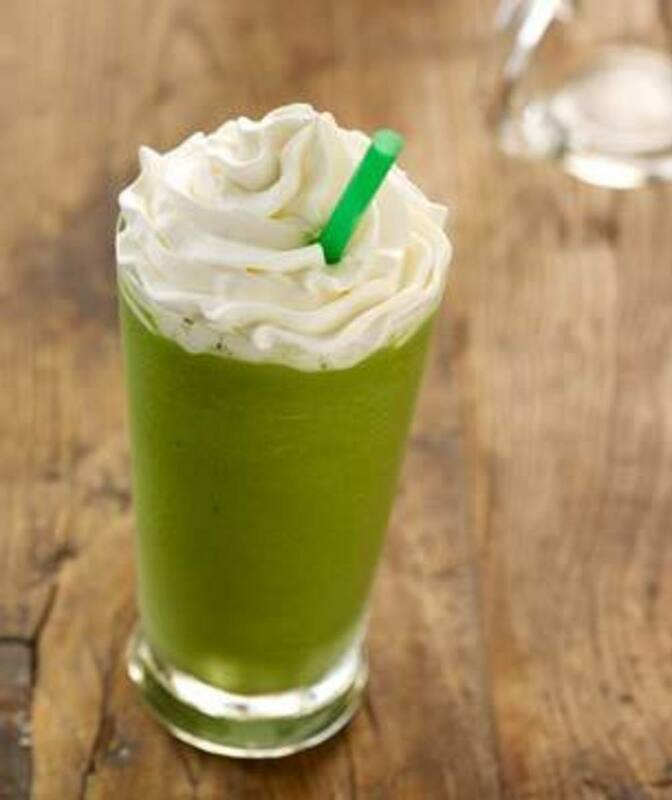 Do you know where I can find an exact ingredient list for the Green Tea Frappuchinos? There is something in them that makes me sick every time I drink them and I am trying to identify what it is so I stay away from it. Thanks for being my navigator at Starbucks! Great Hub! I don't go to starbucks often, but you're making me want to go right now! Good Hub! Thanks for writing this! I always feel so lost when I go to Starbucks - there's so many choices that it's overwhelming. This is great information! I will check out your other menu guides as well!